Using a mandolin, slice potatoes about 1/8 inch thick. Place potato slices in a large bowl, add cold water to cover, and stir to release starch; drain. Repeat this process until the water runs clear. With the potatoes in the bowl, add the vinegar and water; let the potatoes soak for 30 minutes to 2 hours. When ready to cook, drain the water and pat each potato slice dry. In a medium heavy pot with a deep-fry thermometer, pour in the vegetable oil. Heat oil over medium-high until thermometer reads 300 degrees F.
Using caution, fry potatoes in small batches turning occasionally to cook evenly until golden and crisp. Between batches return oil to 300 degrees F. Each batch will take approximately 5 to 10 minutes. Use tongs or a slotted spoon to remove potato chips and transfer to a paper-towel lined wire rack. Season with salt. Use a grater or a microplane to zest the skin of a blood orange; do not zest the white pith. In a small pot, combine the zest and the sugar. Cook over medium heat for 10 to 15 minutes or until the zest is tender. 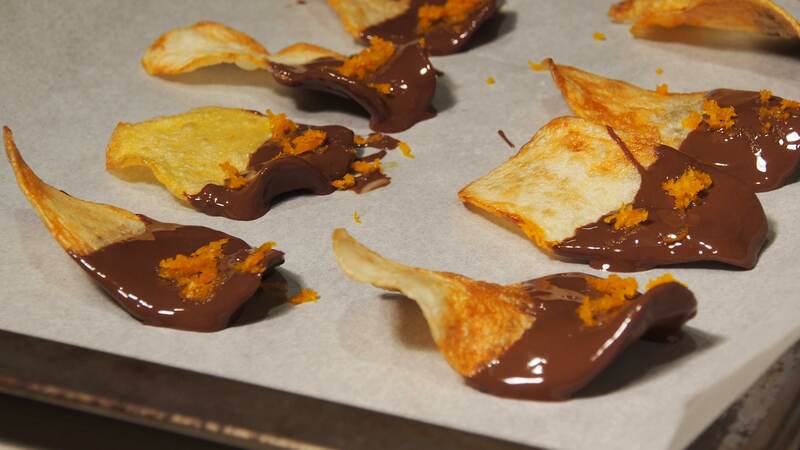 Using the prepared dipping chocolate, dip the potato chips one by one into the chocolate, covering each chip half way; place on parchment paper. Before the chocolate has hardened, sprinkle the candied zest over the chocolate portion of each chip.